Neo4j.rb is an Active Model compliant Ruby/JRuby wrapper for the Neo4j graph database. It uses the neo4j-core and active_attr gems. 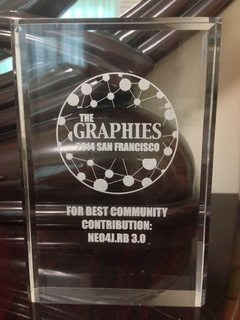 Winner of a 2014 Graphie for "Best Community Contribution" at Neo4j's Graph Connect conference! Neo4j.rb v4.1.0 was released in January of 2015. Its changes are outlined here and in the announcement message. It will take a little time before all documentation is updated to reflect the new release but unless otherwise noted, all 3.X documentation is totally valid for v4. Always welcome! Please review the guidelines for contributing to this repository. Neo4j.rb - MIT, see the LICENSE. Neo4j - Dual free software/commercial license, see Licensing Guide. Notice: There are different licenses for the neo4j-community, neo4j-advanced, and neo4j-enterprise jar gems. Only the neo4j-community gem is required by default. Generated on Fri Apr 12 01:45:00 2019 by yard 0.9.19 (ruby-2.5.1).